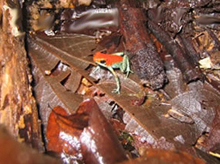 Costa Rica ranks 14th in the world for amphibian species, with a total of 180. The Sarapiqui area is located on the Caribbean slope of Costa Rica, which represents almost half (46%) of the total species found in the country. Costa Rica is home to many incredible, unique species found nowhere else. The Frog Tour consists of a multimedia presentation on the natural history of amphibians. Later, visitors take a short walk (30–40 min.) to the outer edges of the Tirimbina rainforest to visit a small pond. A trained guide will provide a safe environment for close contact with the species that are found, while learning about their adaptations and way of life. The Frog Tour is offered from 7:30–9:30pm, all days.